Note: This post is expanded from a reply I sent to Pessimippopotomus in the discussions of CJA's review of "Time of the Doctor" from last night. A lot of fans have complained about the general timey-wimeyness of Moffat's Who, but I think that was true of Russell T. Davies' run on the show as well — maybe even more so. It's not a complaint, because both producers have always shown that they're really more interested in the fantasy wish-fulfillment aspects of the show, as opposed to the more SFnal elements. For both men, the Doctor was an important part of their childhoods, and being able to put their own personal stamp on the character and his mythology is more important than story logic or coherent worldbuilding. Though in a lot of ways this is nothing new; barring the end of Tom Baker's run and the early Davidson years, there's never been much of an emphasis on hard SF or narrative experimentation, and the show's almost always been focused on magical science and weird creatures. The reality is that, while they share the same title, main character, and universe, the 1963-1989 Doctor Who and the current version are profoundly different shows. The original program was a narrative-based serial centered around cliffhangers. The current show is a character-based drama based on emotional bonds and epiphanies. In the old show, the Doctor solved problems; in the current show he helps people, and sometimes himself. As a result there's less of an emphasis on the sorts of stories that defined the original series. Superficially they're the same: Monsters threaten the peace, and the Doctor intervenes. But the nature of the intervention has changed from a cerebral solution to an emotional one. A large part of that is because of the change in format; it's really hard to establish and develop a complex premise in 50 minutes, as opposed to a 90 or 120 minute serial. But part of that is also because the viewers, kids and adults alike, want more of an emotional link to the characters through humor and pathos. It's surprising how little of that there is in the old show, even with characters you like. When Sarah Jane departs at the end of "Hand of Fear," it's pretty anticlimactic. At first she protests a little, but then she takes her stuffed owl and goes. No hugs, no big speeches. The Doctor never mentions her again, even though she'd been a series regular for three years, spanning two eras of the show, and presumably the audience would be invested enough in her character to want to know what happened to her. Today the departure of just about any companion is a BFD, with lots of hugs and weeping, and usually major consequences to the show's overall storyline and the Doctor's mental state. In the old show, for the most part, there was very little fuss. It was acknowledged as a semi-annual turnover in the cast, and often the writers would have to come up with torturous leaps of logic to explain why the characters were leaving, like Leela deciding to marry a random Time Lord redshirt. For a show that, even in the '70s, had a remarkable sense of continuity, there wasn't a lot of emotional depth. The Doctor didn't even really seem to like people that much, and beyond his companions he didn't appear to cultivate a lot of friendships. 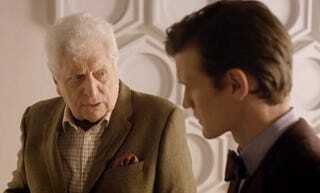 Something like "The End of Time," which is centered on his relationship with Wilf, would have been unimaginable in Tom Baker's time, or even with one of the less aloof Doctors, like Davidson. Part of that is that TV has changed dramatically over the last few decades, especially in the fifteen-and-a-half years between "Survival" and "Rose." It used to be the sort of thing that you watched casually week to week; you weren't supposed to get deeply invested in the emotional lives of the characters, and the shows were designed to keep that involvement to a bare minimum. You were drawn by the actors' charisma or good looks, but you weren't supposed to worry about their inner lives, which were mostly nonexistent. It was the fans who read deeper meanings into the shows, and through fan fiction and essays they provided the emotional resonances that the TV shows were not intended to evoke. Doctor Who is a great example of a show that went full circle through the cycle of fandom; many of the writers and showrunners, as well as the actors, were great fans of the program when they were kids, and many of them worked on semi-official tie-in novels or radio plays while it was in hibernation. By reviving the program, they effectively recreated it in their fannish image; the characters are now capable of expressing the thoughts and emotions that could only be inferred in the original version. Wish-fullfillment of a sort. I recently watched a bunch of Tom Baker Doctor Whos on Netflix and DVD, inspired by the Fourth Doctor's cameo in "Day of the Doctor" and as a general run-up to "Time of the Doctor." It's generally believed that Capaldi's Doctor will be closer to Baker and Pertwee than Tennant or Smith — less Manic Pixie Dream Boy, more mature and intense. And considering reports that Season Eight will be more "gothic," influenced by Phillp Hinchcliffe's classic tenure on the show, there's the sense that Who in 2014 will be a lot closer to Who in 1975 than its recent incarnations, with darker threats and a more mysterious protagonist. But I don't think it'll be all that different, even when Moffat hands Who off to another showrunner (Gatiss, maybe?). The current version of the show has been a huge hit for the BBC, transforming a cult program into a global hit. One thing that both shows have in common is that the more things change, the more they stay the same.